The 2012 Campbell Ranch Syrah: You’ve heard of umami in wine, well, the 2012 is a great example of what that means. This wine has a salty richness on the palate that reminds me of that umami flavor in meaty ramen and/or chicken noodle soup. Lots of savory aromas too, along with a beefy/tomato nose. This is not a shy Syrah, it has elegance but it’s a bit more of a tannic bruiser than Anthill’s Peters Vineyard Syrah. With too much oak and picked at higher brix I probably wouldn’t be such a fan of this wine but luckily all neutral oak and the right amount of acidity makes it just about perfect for me. Those interesting aromas give this Syrah just the the right kind of weirdness to keep me happy. I can’t wait to see where this ends up in five or ten years and I hope I can keep my hands off it until then. The 2012 Peters is a more floral and mineral-driven Syrah, with almost a more Pinot-like sensibility. There are aromas of salted plum too. It’s light and bright on the palate. In its current stage of development it’s maybe not as complex as the Campbell’s but it has a gorgeous lightness to it. It’s a beautiful example of cool-climate Syrah, and it’s a wine that could age for a while I’m sure. This is a foggy, cool vineyard on the outskirts of Sebastopol where the Anthill crew asked the grower to plant a little Syrah alongside the Pinot. They’re the only ones who get the fruit and they really know what to do with it. I let this wine sit out on the counter for a day and it really became more expressive and developed some of that umami character. It still has salted plum aroma and a pervasive minerality but the mid-palate is less angular. Just like the Campbell, it’s another Syrah to lay down for a few years to see what comes of it. Anthill is the brainchild of Webster Marquez, David Low and Anthony Filiberti who all met while working at Willems Selyem. 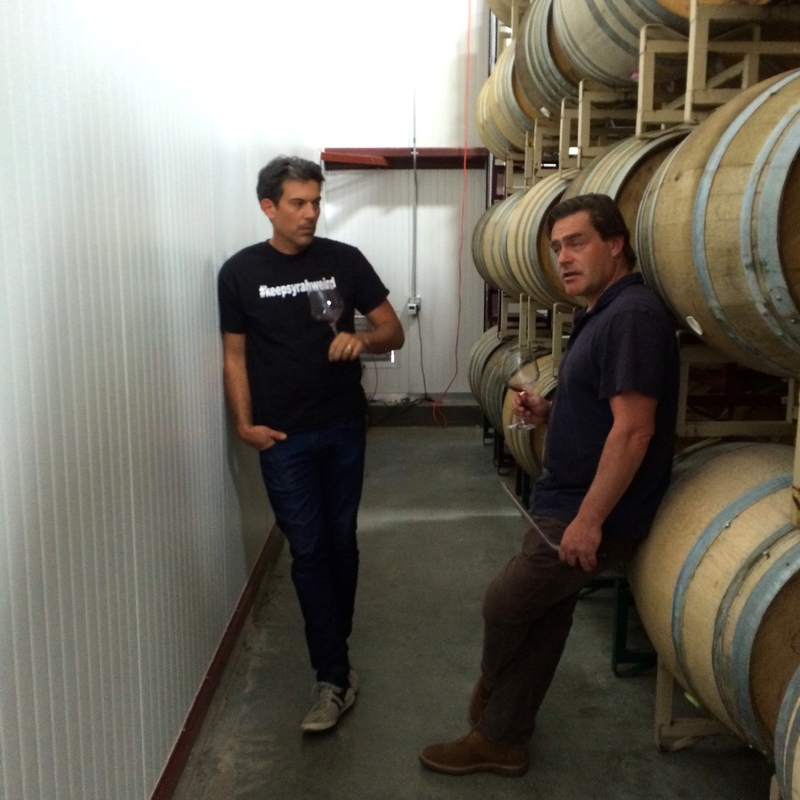 They started the winery on a shoestring with the goal of celebrating small lot vineyards in California. They don’t set out to make wines that speak of the old world but they do appreciate cooler sites for Syrah that provide wines with structure and elegance. My wife and I visited their open house/pick up party recently to pick up the Syrah and try some of their Pinots (which are more coveted than their Syrah) and it could not have been a more laid back setting. I have an old friend who helps out at Anthill so I got to taste some of the ‘13s in barrel and what was most remarkable was the consistency between the vintages. Anthill uses a hands-off approach (very little new oak, no filtering or fining) that they believe lets the vineyard site speak for itself. These wines are a great reflection of that approach. At the 2014 Rhone Rangers event back in March, I had the opportunity to have a little taste of this, as-of-yet un-released, Syrah. One of the best things about tasting William’s wines in the context of the big Rhone Rangers tasting is that they are usually such a distinctly different style from the other wines at the tasting. They stand apart because of their acidity and their lack of oak. They are refreshing wines with fresh fruit and savory character and an old world style that gives the wines a character and complexity often lacking in other Rhone varieties grown in California. I got a chance the other day to sit down with a bottle of the 2012 Saralee’s Vineyard Syrah and revisit it. The wine had rounded a bit with some more time in bottle and it was drinking well, especially after some air. The wine: There’s minerality here that one doesn’t often get from California Syrah, floral aromas, black cherry, a touch of cola. But also noticeable for what is missing, no vanilla, no oak, just pure fruit and savory elements that good Syrah should have. The mid-palate is full with a refreshing lifted quality and lots of mouthwatering acidity on the finish. Not too tannic. 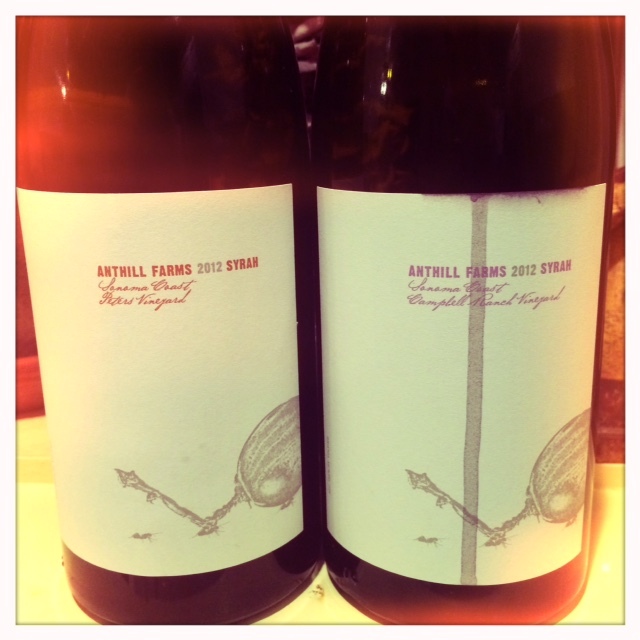 Just a beautiful, true and transparent version of Syrah. If you get a chance to check out William’s wines I would highly recommend it. You can check in on his past vintage (with fancy photos too!) 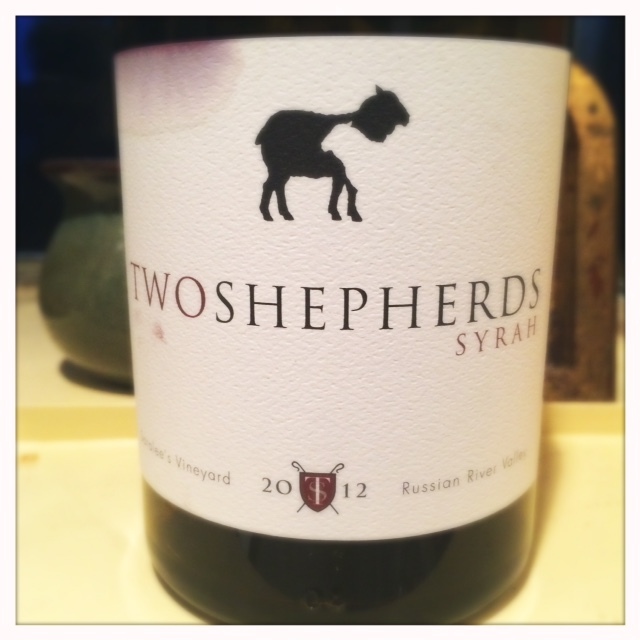 of Syrah that I’ve written about here. I still have a 2011 that I’ll write about again in a few years to see how it’s aged. I have a hunch that the acidity in that vintage and the 2012 will make them wines that can age for a very long time.